Now is the time when your weekends are occupied in revamping your wardrobe and stocking in all the winter outfits while you are parting ways (Obviously only till summers come up!) with your crop tops and sleeves dresses? *Awww** I can totally get it, because you have to keep aside that beautiful wine red dress too! But, wait – are you also parting ways with your midi skirt because you think you will not be able to carry it off in this cold weather? Look who is here at your rescue? And the reason why I just love midi skirts so much is the inspiring ways to wear your favorite midi skirt this winter or any season for that matter! Team it up with a stylish crop top to embellish your summer style while the turtleneck chunky sweater tucked in is no bad pick to vamp up the winters. So many different styles to grab for your wardrobe, isn’t it? Count on all of them and trust me; you will love the way every different style is writing a different fashion story for you. Yes! 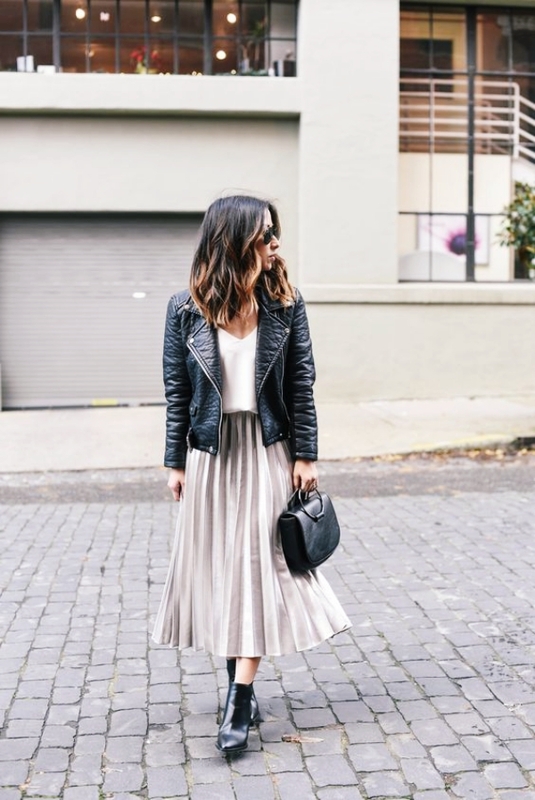 This is the latest trend and is one of the best ways to Wear Your Favorite Midi Skirt this winter! Just opt for plain tops over the midi skirt and settle in for printed sweaters to cover the look. Wear high ankle boots. With the onset of winters, you are going to get loads of different kinds of jackets and sweaters. If you do not want to part ways with your favorite midi skirt, then settle for knitted tops that serve the purpose of a sweater. Tuck it in and you are all set to rock the look. Most of the midi skirts get in the flow towards the bottom of your body… To balance it, opt for tight fitting light colored tees and same tight fitting jackets to complete the look that will ensure you are kept warm as well. If you are looking for work Ways to Wear Your Favorite Midi Skirt this Winter, then this is one good way – pair your midi skirts with plaid shirts and oversized jackets for those lazy work days. You think midi skirts are not going to keep you warm enough? Then, pair it up with high boots and plain casual tops and complete the look with faux fur around your neck! I bet, this stylish look will bring in the required elegance and warmth. A casual black top, midi skirt, leather boots and a leather jacket – do you need anything else to keep you warm with the required level of vogue in your outfit? 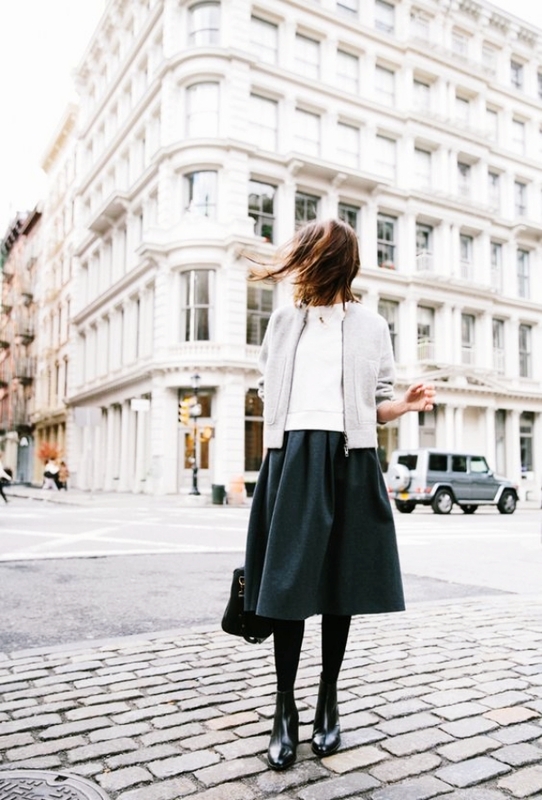 This is one awesome Way to Wear Your Favorite Midi Skirt this winter. You think the skirt is getting in lot of room for cold to enter in? Then pair it up with light colored tights if you are going for light colored tops and vice versa. This will not hamper your look and will also bring in the warmth. Reverse the fashion here, and ditch the plain midi skirts. Opt for plaid midi skirts and full hand tops that will keep you warm. Wrap a fur scarf around and that’s all you need! When not in a mood to grab plaids, I am sure the striped ones would definitely be the right option. Do I need to elaborate this style anymore? Make sure that the leather jacket is the exact size so that it enhances the look. Layering up a printed sweater with a leather jacket over it along with the high boots is what going to turn the winter mood on. If you want to keep it simple, then settle in for ankle boots and long trench coats. 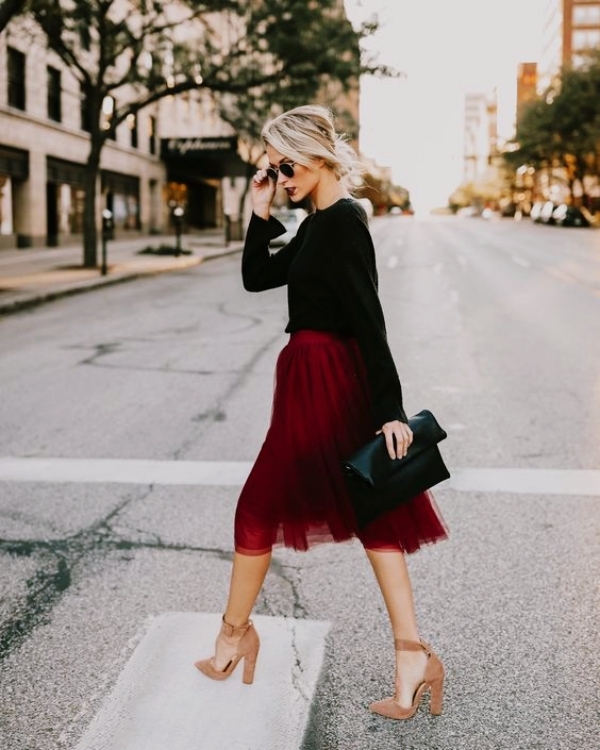 With this look, all kinds of tops will match, so you do not need to think a lot when you are choosing this Way to Wear Your Favorite Midi Skirt this winter! Trench coat is the best layering staple these days and the number of options it gives you to belt up the waist all differently is what makes it my favorite outfit. Yeah! Now you can do that *happy dance* because you have all the reasons to have midi skirts in your winter wardrobe too!